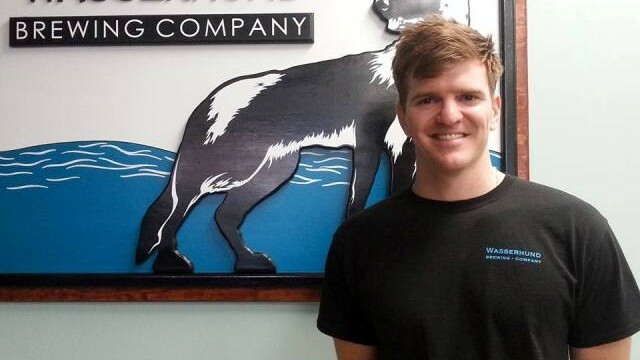 Wasserhund is the brain child of Aaron and Christine Holley, who have Virginia bona fides (Kellam High School class of ’06, Virginia Tech class of ’10) and Aaron’s brother-in-law Craig Lubinski (a West Point grad). The Wasserhund team has enough degrees in chemical engineering, physical science, mechanical engineering, and the like to build a nuclear reactor. Instead, this brainy bunch is creating a fusion of German-style beers, brats, and tasty pizzas at their brand new brewpub in Virginia Beach. After several ‘soft openings’ to beta test the reactions elicited from friends, family, and local beer lovers, Wasserhund’s official opening was August 6. The room was packed to the gills and radiating cosmic energy. It’s a safe prediction that Wasserhund is destined for success. German-style beers are the main focus, with the goal to have approachable, not “extreme” beers. If you want a double IPA brewed with sriracha and fenugreek, you’ll have to look elsewhere. However if you want fresh, well-brewed mostly-German style beers, Wasserhund will have your tail wagging. 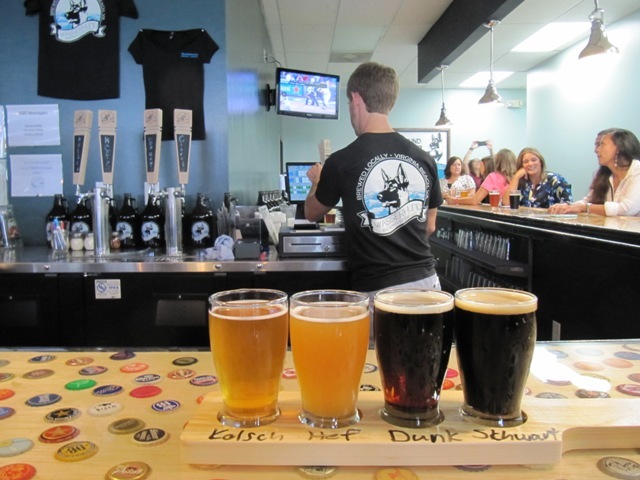 While breweries with tasting rooms are proliferating in Hampton Roads, the same cannot be said for brewpubs. 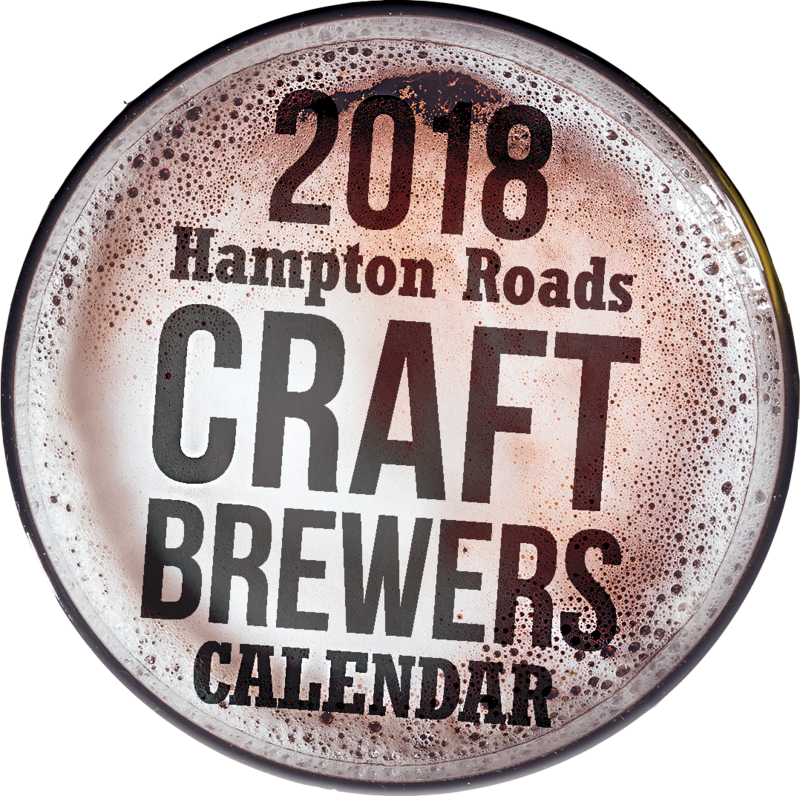 This is only the fourth brewpub in the Seven Cities region; Home Republic and Gordon Biersch in Virginia Beach and Wharf Hill in Smithfield are the other three. A brewpub is a brewery-restaurant, meaning they serve beer brewed on premises but also have a kitchen and a menu with food. Wasserhund is one large room, simple in decor, with a large beer-bottle-cap-decorated wooden L-shaped bar, large common tables for gathering near the bar, typical restaurant seating, and a couple of couches for a ‘living room’ effect. 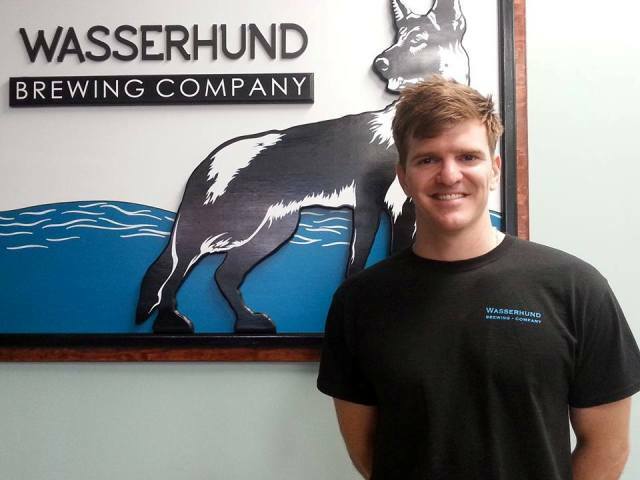 Wasserhund has what we believe is a recipe for success. Excellent beer is the core of the business. Add homemade pizza. Bratwurst. Soft pretzel. Breadsticks. The food menu is simple and focuses on doing a few things well. Craig, the pizza-engineer, channels thermal energy from his large oven to convert homemade pizza dough, mozzarella, tomato sauce, and other top secret ingredients into perhaps the most perfect food known to mankind, and unquestionably the most sublime accompaniment to beer. Only one complaint from Diane (it is rare for her to have only one complaint), which is that a delicious pizza deserves to have anchovies offered as a pizza topping. We are hoping that Wasserhund will “go fission” and add those salty sea-water denizens to the pizza menu. 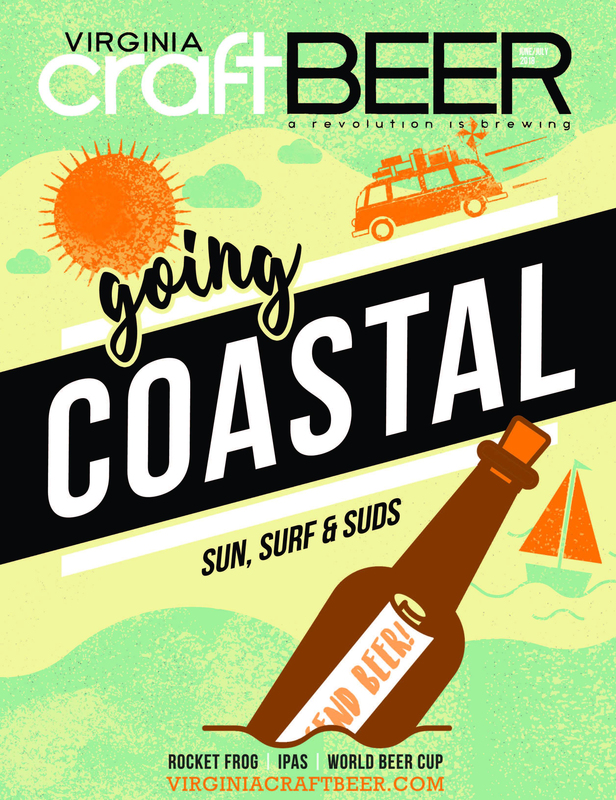 Their briny bite will be tamed with the perfect antidote, beer. Aaron brews on a 2-barrel (62 gallon) system back in the kitchen area, and has four lagering tanks. He has been busily brewing four times each week in order to have eight different beers on tap, an impressive accomplishment, especially when you consider that several of these beers are lagers, which can require up to two months of fermentation and storage at cold temperatures. When you hear these beers are “hand crafted” it isn’t hyperbole. All the beers are brewed here and are only available here (at least for now), although you could bring or purchase a growler and take some beer home with you. All of the beers tasted were very well executed and clean, not an easy feat for a small start-up brewery. Wasserhund is off to an impressive start. Some of the beers available at the grand opening, with tasting notes, are as follows. (Recipes and beers available are expected to change over time as recipes evolve and as new styles are brewed, for example, an Oktoberfest and a marzen are on the way). Hefeweizen – An excellent version of the classic, a cloudy, bright yellow-gold, unfiltered, effervescent German-style wheat beer. This version has the fresh bready-wheat flavors and subtle yeast-derived clove and banana notes characteristic of this style. Bursting with flavor and refreshing. Kolsch – Light, delicate, and easy-drinking, this is a very tasty golden kolsch with a tad more malt character than classic versions of the style. If you like very light “smooth” beers that are not bitter at all, this is the beer for you. Dunkel – A German-style brown lager, full of rich dark Munich malt flavor, with just enough hops to balance out the sweetness of the malt without adding bitterness. If you like brown ales you will like this delicious Dunkel. Schwarz IPA – The name is a German twist on the bitter, hoppy, “black IPA” style, with schwarz meaning “black.” Also schwarzbier is a German-style black lager that is light bodied and has a mild roasted dark malt character and little hops flavor or bitterness. Although the name sounds like this may be a black IPA, or a schwarzbier with extra IPA-style hopping, this beer tastes more like a robust porter. Dark brown, medium-full bodied, with roasted malt character, it is a tasty beer. While the menu says this beer has 80 IBUs (international bittering units), which means it should be quite bitter, the hops may have been overwhelmed by the dark and roasted malt character. Order this if you like a full-flavored robust porter brewed with roasted malt. Hoppin Honey Ale – A true ale character, an amber-colored beer with fruity esters, sweet notes from the honey, and some citrusy hops flavor and bitterness to balance but not overpower. Medium-light bodied; if you like amber ales, Irish reds, or pale ales this beer would be a good choice. 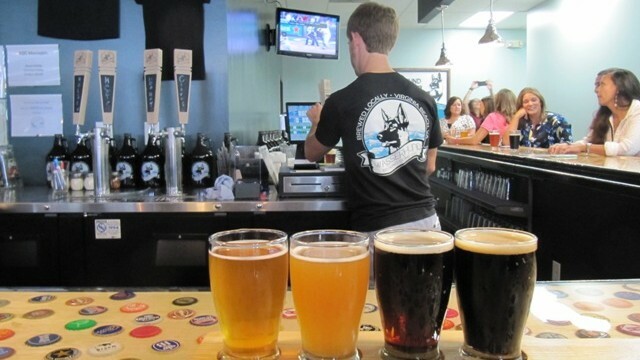 Wasserhund is located in the Hilltop area, at 1805 Laskin Road in Virginia Beach. It is directly across Laskin Road from the Whole Foods Market. Check the website www.wasserhundbrewing.com for opening hours. At the present time they are only open at lunchtime on weekends and are closed on Tuesdays and Wednesdays.